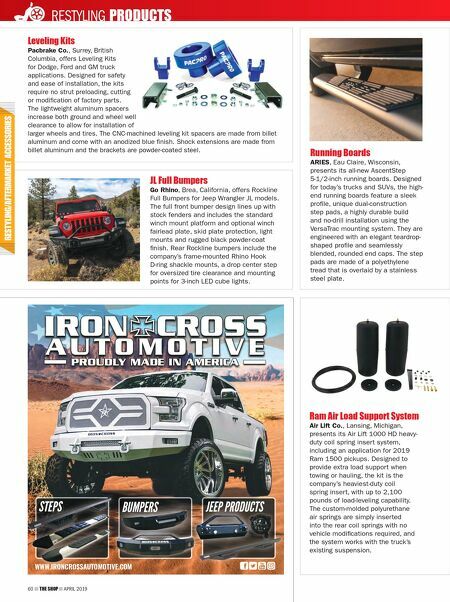 APRIL 2019 THE SHOP 61 JL LED Third Brake Light Ring Rugged Ridge, Suwanee, Georgia, a Truck Hero Inc. company, presents its new LED Third Brake Light Ring for 2018-'19 Jeep Wrangler JL models. The ring mounts directly behind the spare tire, positioning it at a lower height on lifted vehicles for optimum visibility. Equipped with 93 bright red DIP LEDs around the perimeter, light output from the ring projects through the spare wheel's openings, creating an attention-grabbing display. The system is IP68 waterproof-rated for dependable performance in all weather conditions. JL Speedometer Calibrator Hypertech, Memphis, Tennessee, presents a Speedometer Calibrator for 2018 Jeep Wrangler JL 3.6-liter applications. Designed for vehicles that have added larger tires, the calibrator features speedometer and odometer correction for 24- to 40-inch tires in 0.25-inch increments, and the ability to read, display and clear diagnostic trouble codes (DTCs). It is internet-updateable. Jeep Fenders Daystar Products, Phoenix, presents MCE Fenders for Jeep YJ, TJ/LJ and JK/JKU models. Made in the USA, the fenders blend the aggressive, true flatty fender look of original Jeeps with today's more modern Wranglers. They add more tire clearance for an aggressive look, and are constructed of MCE-spec TPO plastic that won't sag or crack, and is UV-stable and flexible. MCE's Jeep JK fenders replace the entire stock fender and allow a 35-inch tire without a lift. They are easy to install, come with a DOT-legal side marker light and include stainless hardware. 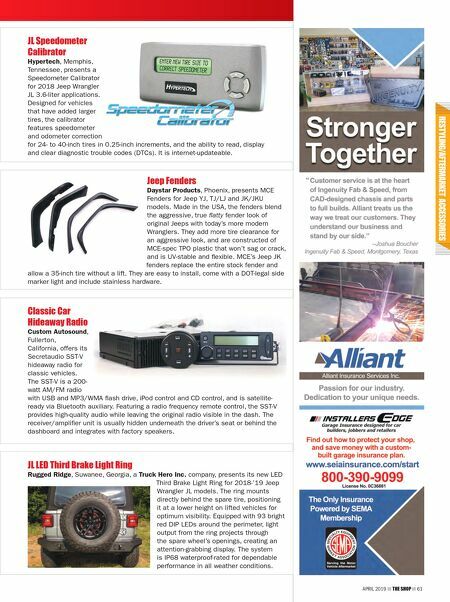 Classic Car Hideaway Radio Custom Autosound, Fullerton, California, offers its Secretaudio SST-V hideaway radio for classic vehicles. The SST-V is a 200- watt AM/FM radio with USB and MP3/WMA flash drive, iPod control and CD control, and is satellite- ready via Bluetooth auxiliary. Featuring a radio frequency remote control, the SST-V provides high-quality audio while leaving the original radio visible in the dash. The receiver/amplifier unit is usually hidden underneath the driver's seat or behind the dashboard and integrates with factory speakers.